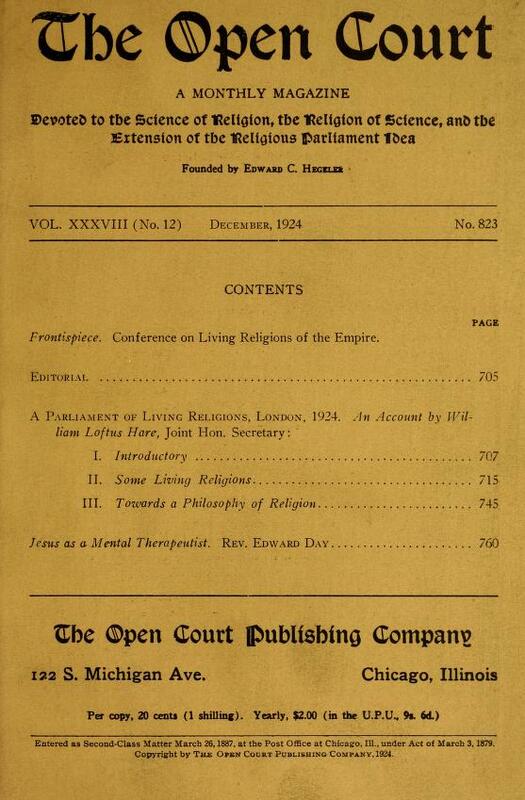 An account of the "Parliament of Living Religions," in London, 1924. Includes 2-page summary of presentations by Mountfort Mills and Ruhi Afnan. The correct spelling is "Mountfort," but in this article it is noted as "Mountford," and sometimes is written as "Montfort". This document is online in a variety of formats at archive.org. We placed Hinduism first on our program for various reasons which are apparent. Two hundred and seventeen millions of our fellow citizens deserved more than one lecture and would have had more if our time for preparation had been extended. Islam came second on account of its sixty-seven million adherents in the Empire. Islam is more than a faith; it is theoretically a polity which includes and excludes the British Empire simultaneously. We did not meet it in its political aspect but in friendly and tolerant religious attitude of its three notable expositors. In another way our conference was helped by the power of the voice. Twice the Arab Mufti of the Woking Mosque recited with great power Suras from the Quran, and twice the Sufi Raushan Ali, in lighter tones, chanted from the scriptures and poetry of his faith. The majority, perhaps, did not understand the words but everyone was affected in a strange way by this music of the soul. 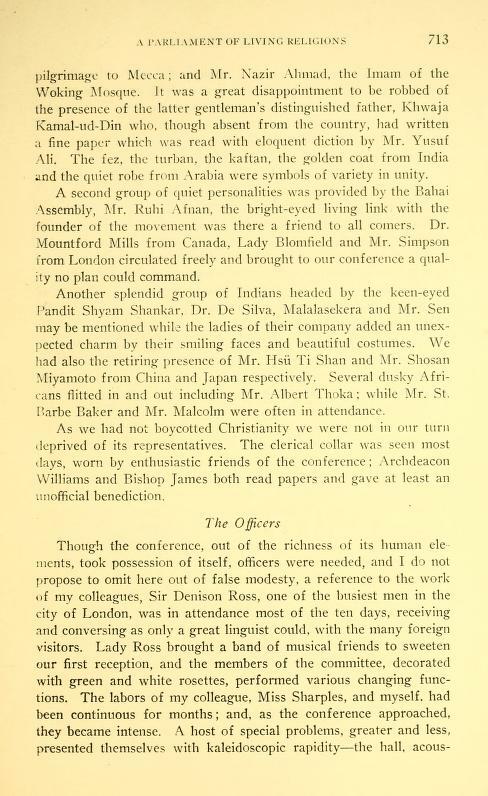 Other Moslems who graced our assembly were Mr. Yusuf Ali, once of the Indian Civil Service; Lord Headly who has made the pilgrimage to Mecca; and Mr. Nazir Ahmad, the Imam of the Woking Mosque. It was a great disappointment to be robbed of the presence of the latter gentleman's distinguished father, Khwaja Kamal-ud-Din who. though absent from the country, had written a fine paper which was read with eloquent diction by Mr. Yusuf AH. The fez, the turban, the kaftan, the golden coat from India und the quiet robe from Arabia were symbols of variety in unity. A second group of quiet personalities was provided by the Bahai Assembly, Mr. Ruhi Afnan, the bright-eyed living link with the founder of the movement was there a friend to all comers. 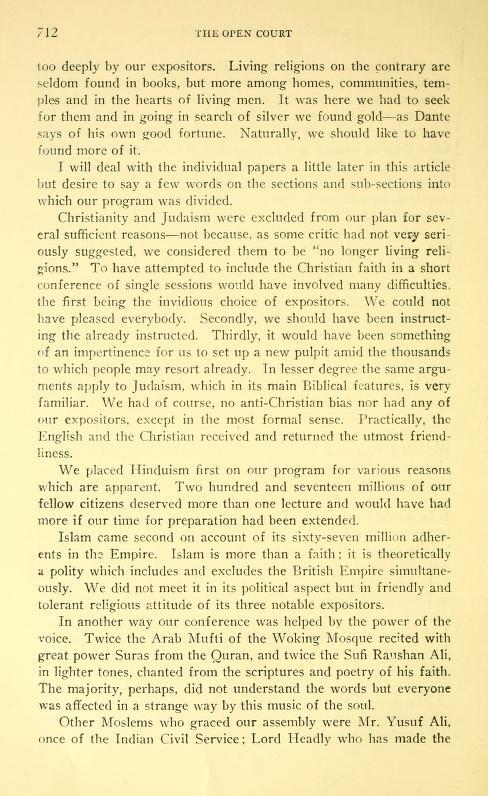 Dr. Mountford Mills from Canada, Lady Blomfield and Mr. Simpson from London circulated freely and brought to our conference a quality no plan could command. The first paper was read by Mr. Mountford Mills, Bahá'í delegate from Canada. He began by referring to an address given by Abdu'l-Bahá in the City Temple, London, on September 10, 1911, in which he said: "There is one God; mankind is one; the foundations of religions are one. Let us worship Him, and give praise for all His great prophets and messengers who have manifested His brightness and glory." Thus there is no need to assert the fact that the Baha's cause seeks no competitive victory among the world's religions and lays no additional frontiers among the boundaries already dividing mankind into different creeds but rather its ideal is unity consciously binding the hearts of men. The origin of the Bahá'í cause coincided in point of time with the beginnings of what is considered the opening of a new era in human development. In Persia between May 23, 1844, and July 9, 1850, occurred that remarkable series of events known to history as the "Episode of the Bab," though prior to this period the teaching had already spread in that country that a new spiritual leader would arise. Mirza Ali Muhammad, who took the title of the Gate (Bab) was this new leader, and within the short six years which elapsed between his declaration and his martyrdom, he had succeeded in shattering the age-long inertia of Persia and in enlisting a large following. But he always asserted that he was but the forerunner of a greater than himself. This greater messenger of truth was Mirza Husayn Ali, a scion of a noble and wealthy Persian family, who was one of the foremost supporters of the Bab, and after suffering much in person and possessions at the hands of the priests of the established religion, was exiled to Baghdad and subsequently to Akka. It was just previous to his departure from Baghdad that Bahá'u'lláh as he had come to be known, declared that he was the one foretold by the Bab. His teachings were largely by letters, as all direct communication with his adherents was cut off during his forty years' imprisonment. These teachings reflected no acquired learning, but were the immediate experience in the soul of one who turned wholly and directly to God. According to them religion is not one of life's aspects, but the predominant spirit expressing itself through all aspects, and again he teaches that all the founders of religion are successive, co-related expressions of the Will of God, identical as to purpose and function, diverse only in that each founder adapted the one divine teaching to the particular needs of his time. A brief summary of these teachings is that they comprise almost equally an interpretation of the fundamentally true in all religions and encouragement and exhortation to respond with spirit, mind and soul to the newer and greater possibilities of this age. After the passing of Bahá'u'lláh, May 28, 1892, his eldest son, Abdu'l Baha Abbas succeeded as executive head of the Cause and expounder of the teachings. These two duties Sir Abdu'l Baha Abbas. 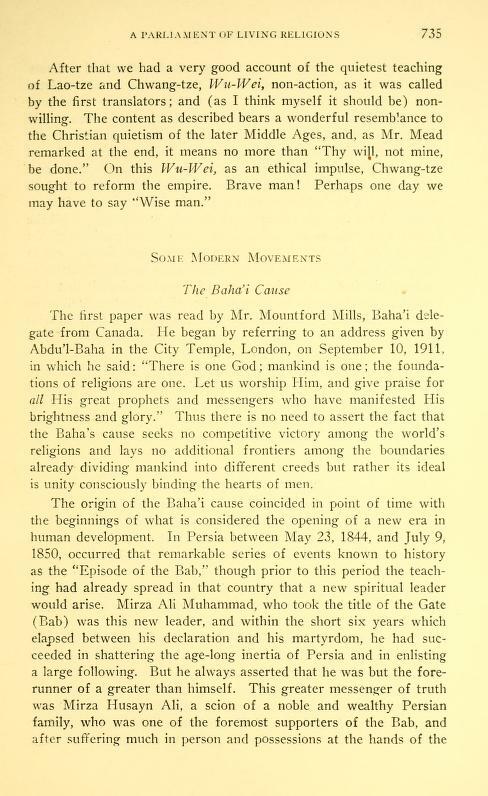 K. B. E., carried out with such success that the Bahá'í Cause not only continued to progress in the land of its origin, but was carried far and wide over the earth, notably in the United States of America, and it has been through the words and writings of Abdu'l Baha that the essential principles of the Cause received their direct applications to problems peculiar to Western civilization. These essential principles are twelve, viz., the oneness of the world of humanity; independent investigation of truth; the foundation of all religions is one; religion must be the cause of unity among mankind: religion must be in accord with science and reason; equality of men and women; abandonment of all prejudices; universal peace; universal education; solution of the economic question; a universal language, and international tribunal. The second paper was read by Mr. Ruhi Afnan, grandson of Abdu'l Baha. This dealt more particularly with the profound changes wrought by the Bahá'í principles in the lives of their followers. Bahá'u'lláh to reconcile the religions laid it down as a guiding principle that the purpose of religion is to provide a social bond, to create a new force in mans' life, to infuse in him the love of all his fellow creatures. In order to eliminate the root cause of all forms of class hatred he proclaimed, "Do ye know why we have created you from one "clay? That no one should exalt himself over another." Critics unable to deny the beauty and the force of Bahá'u'lláh's teachings have yet maintained that they were but lofty ideals incapable of practical application to mans' everyday life. This has however been abundantly proved not to be the case, as is evidenced by the progress which has been made in .many directions in the amelioration of social conditions and the increasing tendency to consider many questions from an international rather than from the narrower national point of view. Tn the East, especially in Persia, the achievements of the Bahá'í cause have been great. 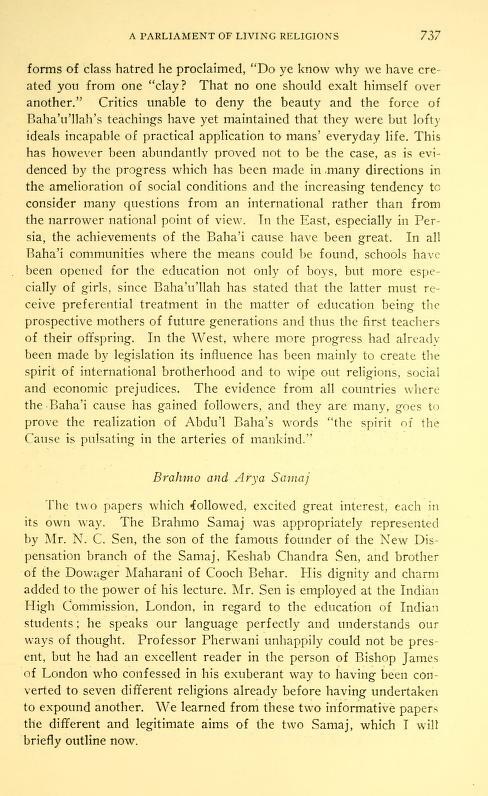 In all Bahá'í communities where the means could be found, schools have been opened for the education not only of boys, but more especially of girls, since Bahá'u'lláh has stated that the latter must receive preferential treatment in the matter of education being the prospective mothers of future generations and thus the first teachers of their offspring. In the West, where more progress had already been made by legislation its influence has been mainly to create the spirit of international brotherhood and to wipe out religions, social and economic prejudices. The evidence from all countries where the Bahá'í cause has gained followers, and they are many, goes to prove the realization of Abdu'l Baha's words "the spirit of the Cause is pulsating in the arteries of mankind."